The main concern for parents should be to bring up their children as noble human beings. That is sufficient. If this is not their greatest hope, in the end the child may take a road contrary to their expectations. Children can play very well. We must try to make them splendid in mind and heart also. You may be new to music lessons and have heard friends, family or acquaintances say their child is learning through the Suzuki Method of musical instruction. 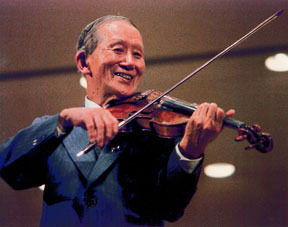 If you have questions, please read the following statements from the Suzuki Association of the Americas about the background and methodology of the Suzuki Method. Children learn words after hearing them spoken hundreds of times by others. Listening to music every day is important, especially listening to pieces in the Suzuki repertoire so the child knows them immediately. In addition to private lessons, children participate in regular group lessons and performance at which they learn from and are motivated by each other. The Suzuki Twinkler is a copyrighted publication of the Suzuki Association of the Americas, Inc. © 1998. Call to schedule an appointment, purchase materials or for more information.